This book establishes an analytical model for the description of existing translations in their historical context within a framework suggested by systemic concepts of literature. It argues against mainstream 20th-century translation theory and, by proposing a socio-cultural model of translation, takes into account how a translation functions in the receiving culture. The case studies of successive translations of "Hamlet" in France from the eighteenth century neoclassical version of Jean-Francois Ducis to the 20th-century Lacanian, post-structuralist stage production of Daniel Mesguich show the translator at work. 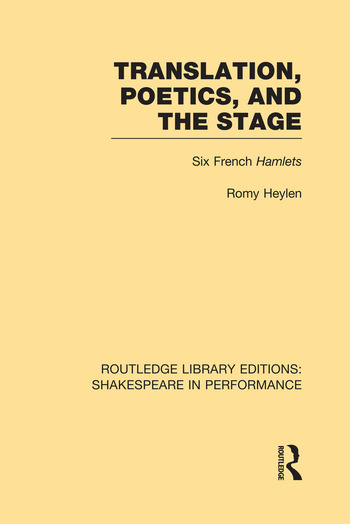 Each chapter focuses on a different aspect of the changing theatrical and literary norms to which translators through the ages have been bound by the expectations both of their audiences and the literary establishment.